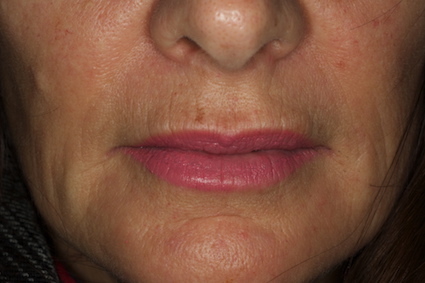 PHOTOGRAPHS: The top photo shows a dramatic difference in the patient’s appearance pre and post treatment. 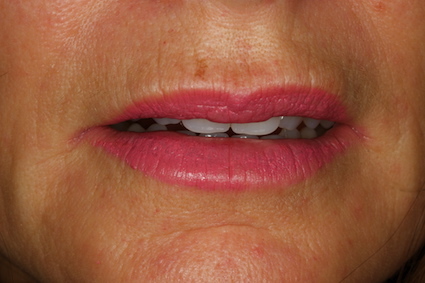 The following two images are post treatment and highlight how significantly the patient’s lipline has been restored with the new Lovebite dentures, as opposed to the final image (pre-treatment). 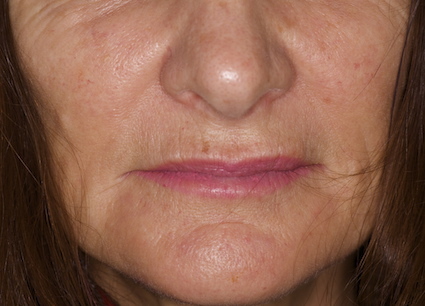 This case is an example of how the Lovebite ‘Oral Lift’ can rejuvenate and refresh the appearance. To produce this outcome requires an innate observation and understanding of the oral architecture of the mouth and facial structures. Richard has developed these world leading techniques over the last 30 years. He lectures and teaches on this subject internationally. This patient had a generic denture appearance pre treatment where the face had collapsed inwards and the support of the exterior oral tissues (cheeks and lips) was compromised. With the Lovebite denture the oral architecture has been rebuilt in the right position, providing support and a refreshed beauty to the face. It is important to note there is no cosmetic surgery involved here. This is an example of the incredible transformation that can occur, with bespoke dentures made specifically to suit the patient’s unique appearance and character.